Observations from ESO’s Very Large Telescope (VLT) have, for the first time, determined the rotation rate of an exoplanet. 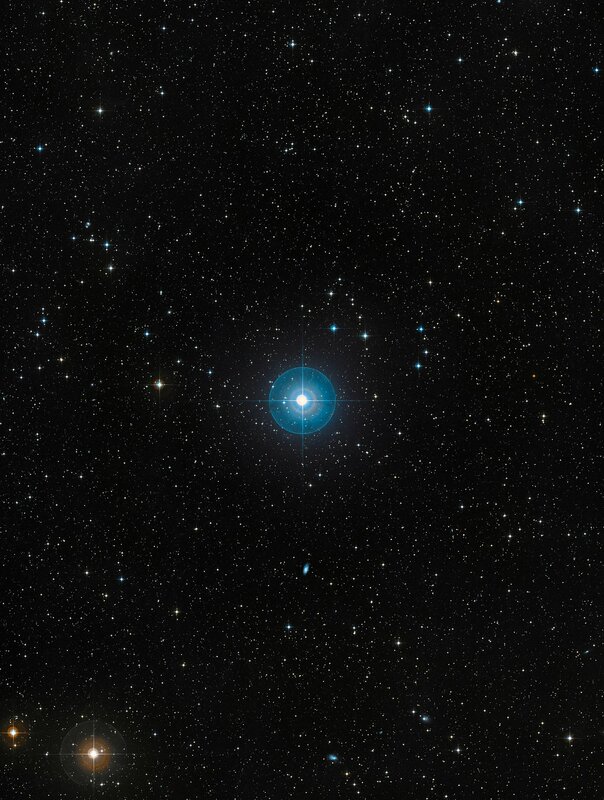 Beta Pictoris b has been found to have a day that lasts only eight hours. This is much quicker than any planet in the Solar System — its equator is moving at almost 100 000 kilometres per hour. 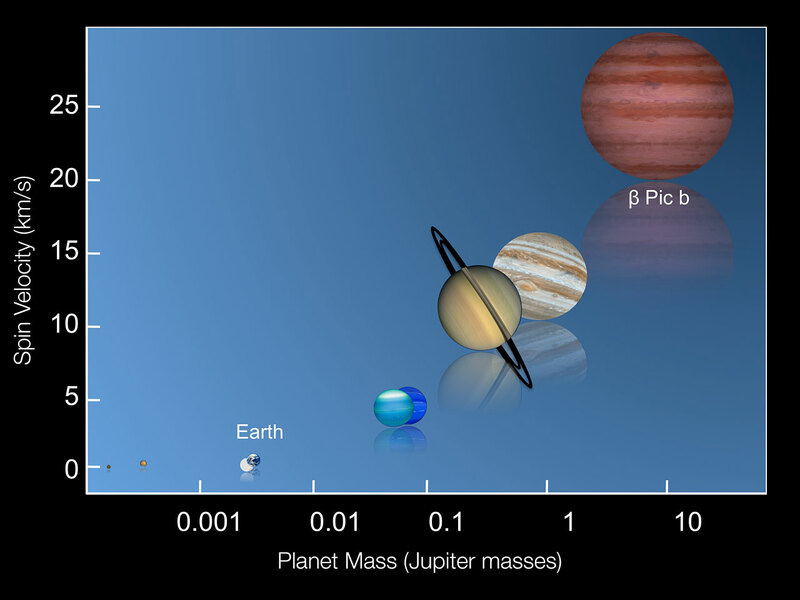 This new result extends the relation between mass and rotation seen in the Solar System to exoplanets. Similar techniques will allow astronomers to map exoplanets in detail in the future with the European Extremely Large Telescope (E-ELT). Exoplanet Beta Pictoris b orbits the naked-eye star Beta Pictoris , , which lies about 63 light-years from Earth in the southern constellation of Pictor (The Painter’s Easel). This planet was discovered nearly six years ago and was one of the first exoplanets to be directly imaged. It orbits its host star at a distance of only eight times the Earth-Sun distance (eso1024) — making it the closest exoplanet to its star ever to be directly imaged . 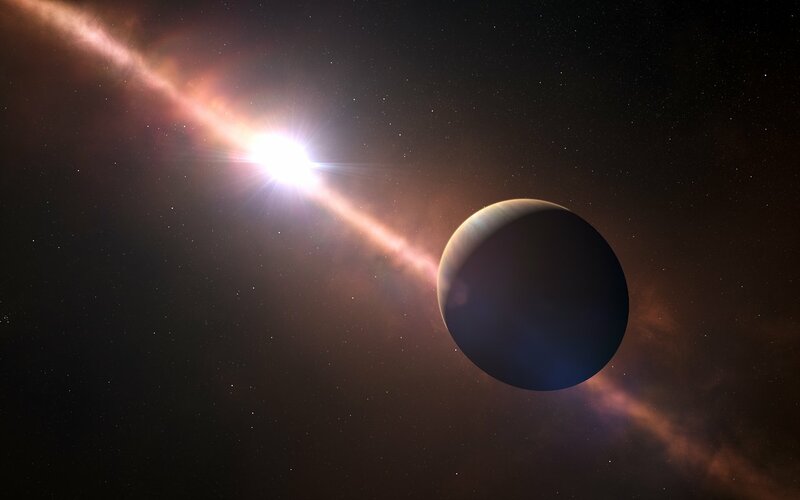 Using the CRIRES instrument on the VLT, a team of Dutch astronomers from Leiden University and the Netherlands Institute for Space Research (SRON) have now found that the equatorial rotation velocity of exoplanet Beta Pictoris b is almost 100 000 kilometres per hour. By comparison, Jupiter’s equator has a velocity of about 47 000 km per hour , while the Earth’s travels at only 1700 km per hour . Beta Pictoris b is more than 16 times larger and 3000 times more massive than the Earth, yet a day on the planet only lasts 8 hours. Beta Pictoris b is a very young planet, only about 20 million years old (compared to 4.5 billion years for the Earth) . Over time, the exoplanet is expected to cool and shrink, which will make it spin even faster . On the other hand, other processes might be at play that change the spin of the planet. For instance, the spin of the Earth is slowing down over time due to the tidal interactions with our Moon. The astronomers made use of a precise technique called high-dispersion spectroscopy to split light into its constituent colours — different wavelengths in the spectrum. The principle of the Doppler effect (or Doppler shift) allowed them to use the change in wavelength to detect that different parts of the planet were moving at different speeds and in opposite directions relative to the observer. By very carefully removing the effects of the much brighter parent star they were able to extract the rotation signal from the planet. “We have measured the wavelengths of radiation emitted by the planet to a precision of one part in a hundred thousand, which makes the measurements sensitive to the Doppler effects that can reveal the velocity of emitting objects,” says lead author Ignas Snellen. “Using this technique we find that different parts of the planet’s surface are moving towards or away from us at different speeds, which can only mean that the planet is rotating around its axis“. This technique is closely related to Doppler imaging, which has been used for several decades to map the surfaces of stars, and recently that of a brown dwarf  — Luhman 16B (eso1404). The fast spin of Beta Pictoris b means that in the future it will be possible to make a global map of the planet, showing possible cloud patterns and large storms. “This technique can be used on a much larger sample of exoplanets with the superb resolution and sensitivity of the E-ELT and an imaging high-dispersion spectrograph. With the planned Mid-infrared E-ELT Imager and Spectrograph (METIS) we will be able to make global maps of exoplanets and characterise much smaller planets than Beta Pictoris b with this technique”, says METIS principal investigator and co-author of the new paper, Bernhard Brandl. 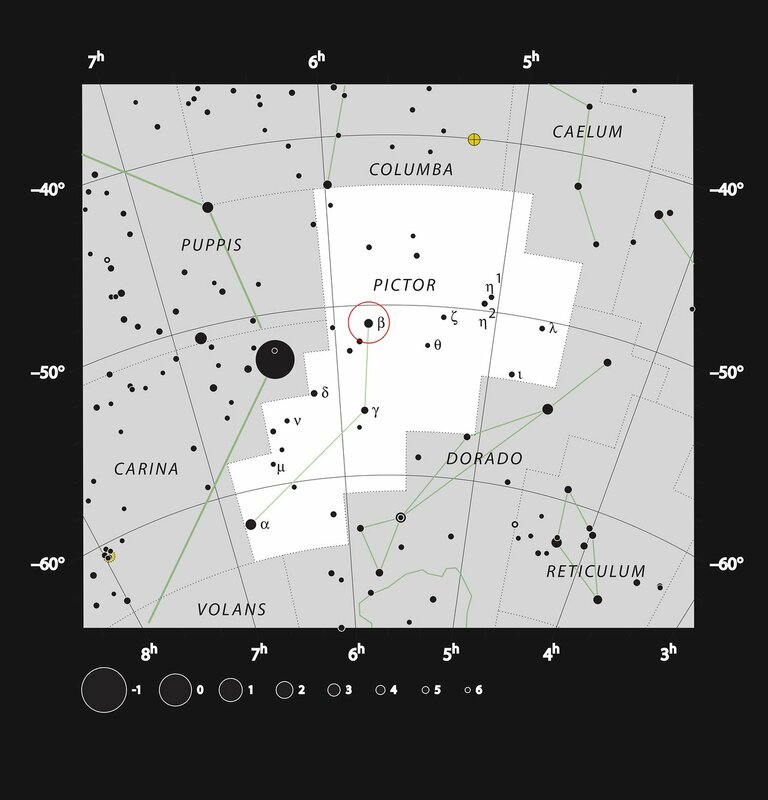 Beta Pictoris has many other names, e.g. HD 39060, SAO 234134 and HIP 27321. Beta Pictoris is one of the best-known examples of a star surrounded by a dusty debris disc. This disc is now known to extend out to about 1000 times the distance between the Earth and the Sun. 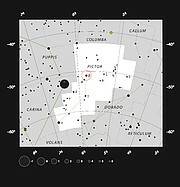 Earlier observations of Beta Pictoris’s planet were reported in eso0842, eso1024 and eso1408. The observations made use of the adaptive optics technique compensating for the Earth’s atmospheric turbulence which can distort images obtained at even the best sites in the world for astronomy. It allows astronomers to create super-sharp images, almost as good as those that could be seen from space. Since Jupiter has no solid surface from which to determine the planet’s rotation rate, we take the rotation speed of its equatorial atmosphere, which is 47 000 km per hour. The Earth’s rotation speed at the equator is 1674.4 km per hour. Earlier measurements suggested that the system was younger. This is a consequence of the conservation of angular momentum and is the same effect that makes a spinning ice skater turn more rapidly when they bring their arms closer to their body. Brown dwarfs are often dubbed “failed stars” as, unlike stars such as the Sun, they are not massive enough to sustain nuclear fusion reactions. This research was presented in a paper “Fast spin of a young extrasolar planet”, by I. Snellen et al., to appear in the to appear in the journal Nature on 1 May 2014. The team is composed of Ignas A. G. Snellen (Leiden Observatory, Leiden University, Leiden, the Netherlands), Bernhard Brandl (Leiden Observatory), Remco J. de Kok (Leiden Observatory, SRON Netherlands Institute for Space Research, Utrecht, the Netherlands), Matteo Brogi (Leiden Observatory), Jayne Birkby (Leiden Observatory) and Henriette Schwarz (Leiden Observatory).